God gave me this lesson today! 9 Let the lowly brother glory in his exaltation, 10 but the rich in his humiliation, because as a flower of the field he will pass away. 11 For no sooner has the sun risen with a burning heat than it withers the grass; its flower falls, and its beautiful appearance perishes. So the rich man also will fade away in his pursuits. 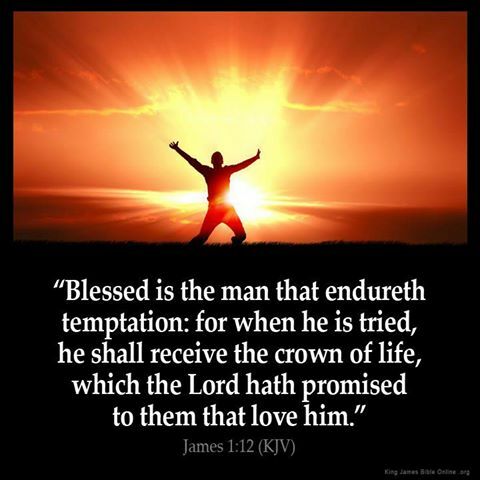 12 Blessed is the man who endures temptation; for when he has been approved, he will receive the crown of life which the Lord has promised to those who love Him. 13 Let no one say when he is tempted, “I am tempted by God”; for God cannot be tempted by evil, nor does He Himself tempt anyone. 14 But each one is tempted when he is drawn away by his own desires and enticed. 15 Then, when desire has conceived, it gives birth to sin; and sin, when it is full-grown, brings forth death.